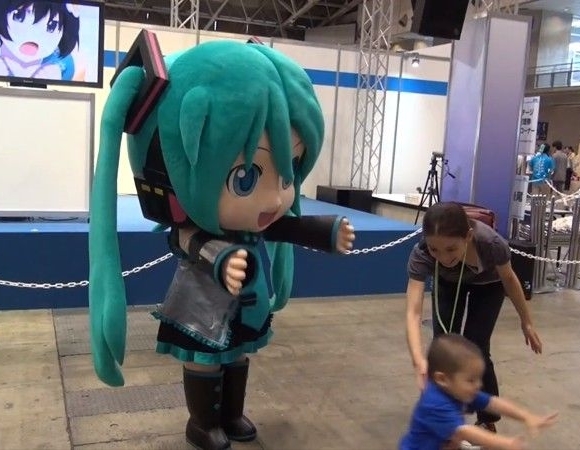 What we now know as Mikudayo (ミクダヨー) began her life as a costume made to promote Sega's "Hatsune Miku and Future Stars Project mirai" video game. Netizens of Japan quickly jumped on the costume's strange appearance, and transformed it into a meme. Good Smile Company, being no stranger to turning internet fads into toys, helped canonize the character as a part of the Vocaloid universe with several Dayo-based products. 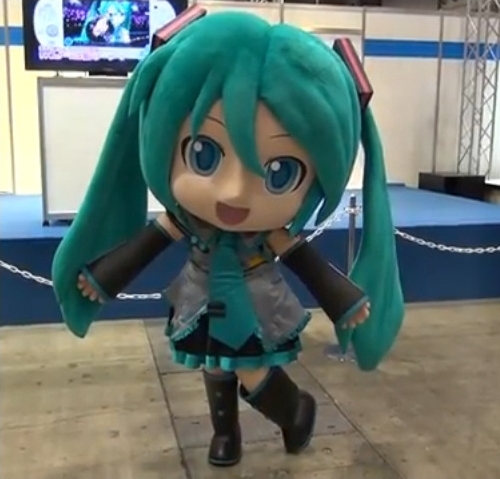 Arguably the most popular of these is the Nendoroid Mikudayo. And so, with the introduction out of the way... HERE'S MIKU!! Mikudayo is the 299th main Nendoroid released, and is one of the simpler figures of the line. This is not a bad thing, mind you, as it allows the toy to be very robust while also capturing the (frightening) nature of the character. Like most Nendoroids, she stands about three and a half inches tall. Her black rain galoshes put Dayo-sama in the elite club of Nendoroids that can stand by themselves. However, that big head of hers means she's a bit tippy on those little feet. The toy has excellent detail all over, and even recreates many details from the real Hatsune Miku, albeit in a distorted form which reflects the nature of Mikudayo. Mikudayo's articulation is basic, but completely self-contained, as her arms and legs move about with smooth-feeling joints. Getting her to balance in a decent pose can be tricky, but the figure can emulate the awkward motions of the real life costume. In a nice bit of subtle engineering, Dayo-sama's shoulders can swing in and out thanks to her upper body being separated into movable blocks. These joints follow the lines of her costume, so they don't break up the figure's looks in an obnoxious way. If you need more support, Mikudayo does still come with a Nendoroid stand. With it, Dayo-sama can jump for joy...? The hole on her back is compatible with other modern figure stands, so what you can do with your Mikudayo is only limited by your imagination. Her final accessory is a lollipop that was given out during a promotional collaboration between Mikudayo and Fujiya, a manufacturer of candy and other sweets. The fake food item comes with its own hand to hold it, which replaces her default left hand. You can also remove the lollipop if you wish to give it to other figures. "Ah, thank you very much! I just love licking lollipop-"
"Snake, Foxhound has a new operative named Smiling Leek! She's giant and Dayo. Don't let her get too close or..."
Dayo-sama works very well with her fellow Nendoroids, and she's darn near a "Super Movable" one just like Solid Snake! And of course, you can totally swap Mikudayo's face part into other Nendoroids for even more fun! On the same token, you can also use faces from other figures on Dayo-sama, but why would you want to? There are those who say, "Dayo-sama shines brighter than all, even when consumed by the darkness..."
Overall, Nendoroid Mikudayo is a wonderful figure, and should most definitely be a part of everyone's collection. In fact, the toy was so well received that it got a reissue this year. She is also available in Sakura petal livery, and will soon be getting a winter-themed colorway for even more Dayo in your life! By my deeds, I honor her, dayo. This is one of the few nendoroids i've considered buying multiples of. It's so cheap and army building a mikudayo army is totally worth it. Its kind of a shame that it had to be number 299, right before miku 2.0 came out with the new face swap system though.